Clean water is a precious commodity, and as a gardener, you can play a role in conserving in the Great Lakes. That was the message of Larry Brooks, who does communications for Buffalo Niagara Riverkeeper, in a Gardening Mondays talk downtown at the Buffalo and Erie County Public Library. Living on the shores of the Niagara River and Lake Erie, it seems that water is one thing we shouldn’t have to worry about. After all, one-fifth of the available fresh water on earth is located in the Great Lakes. 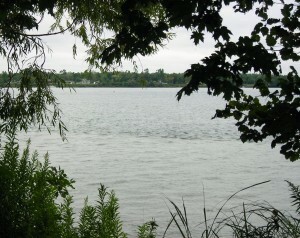 The Great Lakes face several threats, Brooks said. One threat is diversion of Great Lakes water. Companies are already bottling Great Lakes water, which may be shipped out of the area and not returned to the lakes, he said. There are also people who would like to divert Great Lakes water to the southwest. Other threats include land development, which can cause loss of natural habitat; invasive species; climate change, and pollution. When many of us think of Great Lakes pollution, we think of factories. While industrial activity on the lakes has decreased, Brooks said, mercury is still entering the water from coal-fired power plants. Pharmaceuticals pose another pollution problem. People take medications and excrete them in urine, but water treatment plants aren’t able to filter out these compounds. However, the number one pollution problem for the Great Lakes is a threat gardeners can do something about– sewage runoff. “Four billion gallons of raw sewage winds up in the Niagara River every year,” Brooks said. Gardeners can help by keeping rain water out of the sewage system. 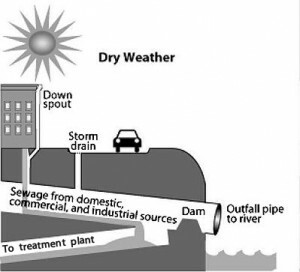 To understand why, look at these diagrams from the U.S. Environmental Protection Agency. 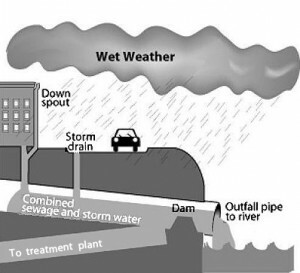 You can see that the storm water system and sewer systems are interconnected. It would have been too expensive to design the systems for peak capacity on the rainiest days, so they were designed for normal capacity, Brooks explained. When it rains, the capacity can be exceeded. To keep the water from backing up into your house, a relief valve dumps raw sewage directly into the river. It’s too expensive to redo the entire sewage system, so we have to do what we can to keep rain water out of this system. “If rain was retained where it fell, we wouldn’t have a problem,” Brooks said. Don’t use hard surfaces that are impervious to rain water in your garden. Instead of concrete walks, use materials that let rain percolate through the soil, such as pavers with space between them. Porous concrete and asphalt are also available, he said. Lawn doesn’t retain much rain; it’s just one step up from a hard surface, Brooks said. 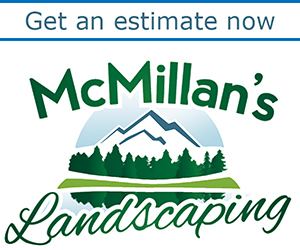 In your yard, use plants with broad roots and broad leaf areas to retain more rain water. Build a rain garden, which we’ll talk about in next week’s issue. Rain barrels collect water from the downspout on your house.The water dumps on top of the barrel and gets inside through holes in the lid. A screen helps keep out leaves. You can use the tap on the rain barrel to fill a watering can, or you can attach a soaker hose, as in the photo at right. Brooks said a gardener can save $34 on water during peak summer months by using a rain barrel. If you have a large roof, your savings could be higher. You can make a rain barrel yourself, or you can buy a rain barrel from Niagara Riverkeepers or from their network of retailers for about $100. It would take about three seasons to recoup your investment. Each barrel holds 60 gallons. If you want to use more than one barrel, you can connect them. Using rain water helps your garden because it contains nitrogen, which your plants need, he noted. Unlike tap water, it doesn’t contain chlorine. Buffalo Niagara Riverkeeper is also selling downspout diverters, which you can see at left. This metal device is inserted into your cut downspout and acts as an interruption. When it is opened, it diverts the flowing water onto your barrel, when it is closed, it diverts the water down your gutter system as though you had never cut it. They cost about $25 and come in two different sizes. Because freezing water expands and could cause the barrel to break, during the winter you must bring the barrel inside or flip it upside down so it doesn’t fill. Another way you can help our waterways is by volunteering in the Buffalo Niagara Riverkeeper’s fall cleanup scheduled for Saturday and Sunday, Sept. 25 and 26. Details will be on their web site soon. To learn more about our Great Lakes habitat, you can take an eco tour with Buffalo Niagara Riverkeeper on the Miss Buffalo on Sept. 5. Cost is $20 for adults, $10 for students. There is a discount for members of Preservation Buffalo Niagara. 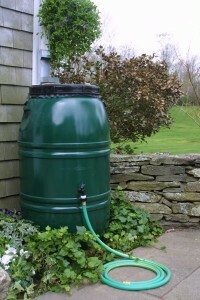 Having a rain barrel can help you collect enough of water during the rainy season. Learning how to make a rain barrel can help you reduce your water bills. 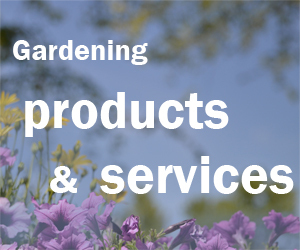 For you to water your garden and the lawn, you need lots water which can cost a lot. Making a rain barrel is not expensive. That’s some of the best rain barrel information I’ve seen online. I tried to make a tutorial too, hope it helps.